Jessica Fuller, Head of Creative Engagement at IADT (Dept. Directorate of Creativity, Innovation + Research). Owen Laverty, Head of Enterprise (LEO). Steve Boucher, Enterprise Innovation Team at Bank of Ireland (R&D and Implementation), responsible for driving Innovation and R&D projects around enterprise, emerging technologies and change initiatives in Bank of Ireland. 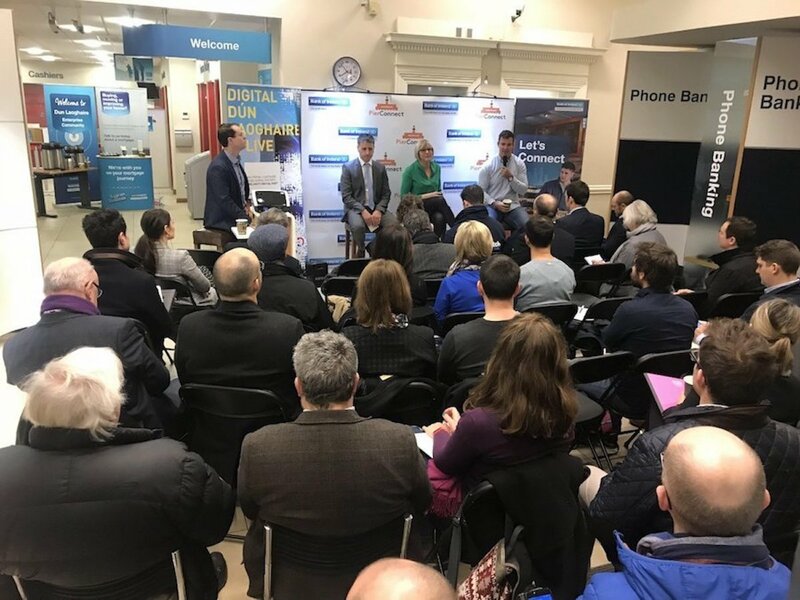 The meeting was facilitated by Eoin Costello, Digital Connector at Digital Dún Laoghaire at Dún Laoghaire Business Improvement District. Topic 1 Why Now is a Good Time to Start a business? Start-ups are not new, the language has changed and the availability of a network is there now compared to 10 years ago. • Dermot Casey (NDRC) confirmed that in his experience the eco-system is growing as the economy is growing. NDRC invest in digital companies in the early stages with the view to scale. • Jake Phillips (Membership Manager at Dogpatch Labs http://dogpatchlabs.com/) said that thought leadership and attending events will help open doors for a startup. There is a large community out there and people who are happy to help and share advice. • Peter Biggs (Vuzo Ltd) recently moved his business to Dun Laoghaire from Brighton in the UK. He drew similarities setting up business in Brighton, a seaside town like Dun Laoghaire, 10 years ago. Topic 2: What obstacles to do entrepreneurs face and what support is available to help overcome these obstacles? Validation “what are you selling? Get a mentor/coaching and be critical about your product/ service. Is there an audience for it? What is the problem? How big is the problem? Can your product/ service solve it? Lack of awareness of what can help despite support and networks that are out there. Access to markets and funding can be the first challenge facing startups. • There are over 60 programs and grant schemes available through LEO that can really help. 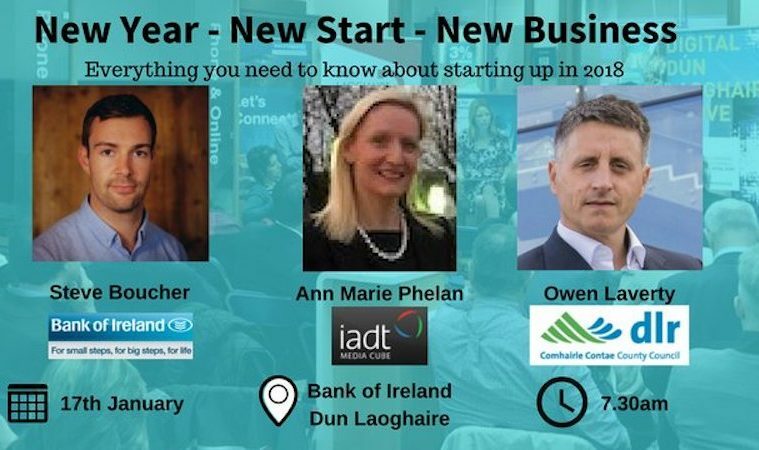 • DLR LEO “Enterprise Week” is coming up in March which will provide a range of networking events. Jessica Fuller said that many people can be afraid to articulate their idea. Does it have opportunity? Is it feasible or not. It’s important to come out of your shell and communicate as much as possible. Help IADT offer is very initial support for the first 3 months where the business idea is being assessed. Steve Boucher, responded to the comment about “not articulating your idea.” The fact is that there is a very small chance that someone will “steal” your idea. Instead, go and talk to people about it and be laser-focused of what you want. He also sees validation as the number one obstacle. You can conduct surveys, develop a prototype, do UX testing, etc. It is important to identify stakeholders in your plan and map out a path how you will get from A to B. Consider the next “right steps” carefully and ask for help by asking someone who is one step ahead in their journey/ venture. Owen Laverty added another reason why business ventures fail is bad legal agreements. His advice is to get a commercial solicitor and “be mature” about it and that is important to include vesting in your agreements rather than giving out equity shareholdings at the start. “When solo entrepreneurs pitch their ideas, they can sometimes take feedback too personally, almost a sense of “Are you saying my baby is ugly?”, Eoin added. One way to avoid becoming too emotionally attached to the business opportunity is to make your startup a team effort. Anthony Quigley (formerly Digital Marketing Institute) on getting started – It needs courage, determination and a bit of luck. If someone would give you money for your idea, Bingo. IADT offers psychological support if needed for example. Paul O’Connor commented that w e are 18 months into our startup and it was a lonely journey at times. There are 2 partners and we are only at proposal stage now. We felt there was much more engagement the last 6 months, people are willing to listen more and we are gaining ground. Topic 3: Sectors that are trending > What’s “hot” right now? Robotics and AI were big last year and continue to be. Other than that, Owen’s advice is to “Look where the pain is. In other words, what saves people time and money?” Check the top 50 Start-Ups, what do they solve for their customers? Jessica Fuller said that everything at the root now has technology and is digital. Governments are driving research that drives investment. Med-tech and fin-tech are strong but whatever idea is good and makes money for you (solves a problem) is worth pursuing. A piece of advice from her own experience is to start with raising sufficient money. Steve Boucher, added that there are innovative ways to raise the risk capital for startup, you can do a crowdsource or funding campaign and always ask friends and family for help. At BOI, they are looking for partnership models increasingly to support startups. Gerard Corcoran, Senior Solutions Manager at Huawei Europe stated that ‘2018 will be the year of inflexion for ubiquitous broadband and AI’. The trends in this sector are 5G (currently running trials) and nbIOT (narrow band internet of things) scaling up, with easy connectivity, low-cost devices and the expanding network. AI (Alexa) and AR will be big in 2018. High Growth Startegies for Your Business – What works?